Potential market drivers for 2018 remain in place for 2019, with markets expected to move on high frequency data providing cues on global growth, and the ongoing US-China trade negotiations into the 1 March scheduled ending of the US pause on tariff escalation. Six of the seven least performing STI stocks of 2018 were amongst the STI’s 10 strongest stocks in the 2019 year through to 23 Jan. The six stocks that averaged 30% declines in total return in 2018 have averaged 11% gains over the first three weeks of 2019. Of these six STI stocks, the two that have been the strongest over the three weeks were Genting and Thai Bev. The two stocks were also amongst the five STI stocks subject to the most net capital inflow by institutional investors from 31 Dec to 18 Jan. The key financial market themes of downside risks to global growth and uncertainty for global trade relations have carried over from 2018, into 2019. Markets have had a firmer start to the year as US and China officials continue to negotiate trade relations ahead of the 90 day pause on US Tariff escalation ending 1 March. The IMF GDP growth forecast for the Advanced Economies in 2019 was shaved by 0.1% from the previous forecast made in October 2018. The IMF GDP growth forecast for Emerging and Developing Asia in 2019 was maintained at 6.3%, as forecast in October 2018. On Developing Asia, the IMF noted that despite fiscal stimulus offsetting some of the impact of higher US tariffs, China’s GDP growth is still expected to slow. This is also due to the potential influence of financial regulatory tightening. China is still projected by the IMF to grow by 6.2% in 2019. The full IMF World Economic Outlook titled Brighter Prospects, Optimistic Markets, Challenges Ahead can be found here. As a consequence of the global outlook, in addition to contained inflation within the US, the Federal Reserve is set to be more patient with interest rates in 2019. The current FOMC dot plot trajectory suggests two hikes in 2019, which is half as many rate hikes as last year. This has seen global equity markets firm over the first three weeks of 2019. Within the Straits Times Index (“STI”) there has been a degree of counterbalance to the moves in the 2019 year to date compared to the moves of 2018. Last year, Hutchinson Port Holdings Trust was the least performing STI constituent, whereas in the 2019 year thus far, it has been 25th best performer among the 30 stocks, with a 1.7% price gain. Moreover, the next six least STI performers in 2018 have been amongst the STI’s 10 best performing stocks in the 2019 year thus far. Thai Beverage PCL, Genting Singapore and City Developments were amongst these six stocks and have been the STI’s strongest stocks from the end of 2018 through to 23 Jan. The other half of the six stocks, Venture Corp, Golden Agri-Resources and UOL Group have ranked fifth, sixth and ninth in the STI’s best performers for the short year to date period. Together these six stocks which averaged 30.3% declines in total return in 2018 have averaged 10.9% gains over the first three weeks of 2019. Both Thai Beverage PCL and Genting Singapore were also amongst the five STI stocks subject to the most net capital inflow by institutional investors in the 2019 year through to 18 Jan. 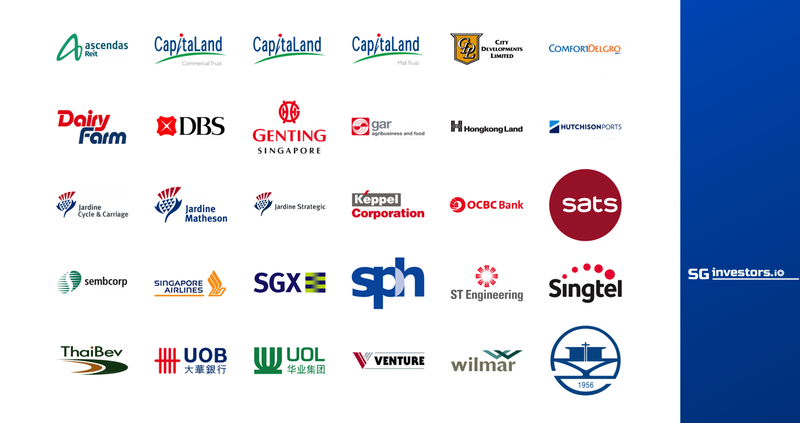 Combined, the two stocks were recipient of S$81 million in net institutional inflow. Two-thirds of the STI stocks are reporting their FY18 results this earnings season. For confirmed and expected reporting dates click here, with updates to the schedule provided every Friday here. The full list of STI stocks is tabled below. Source: SGX Stockfacts, Bloomberg, Data as of 23 January 2018, except for Net Institutional Inflow data which is as of 18 Jan and includes inflows on 31 Dec 2018.